Comprising 16 floors spread over two towers in a “U” shape, the Ewa Tower and Waianae Tower are centered upon the lobby area. 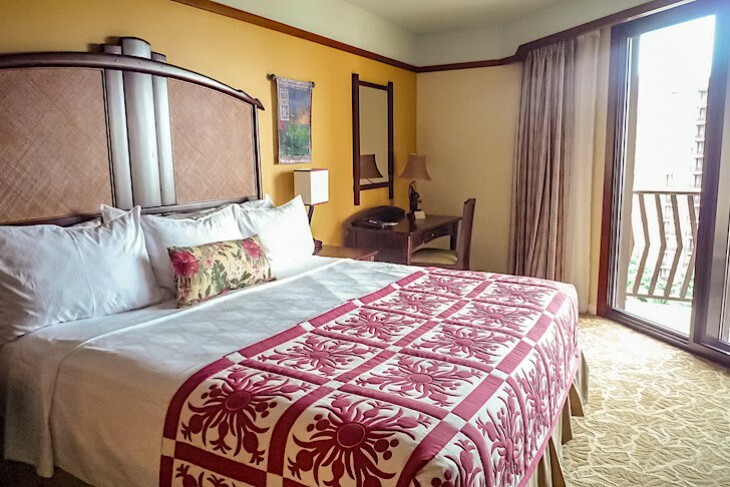 Hotel rooms are found only in the Waianae Tower with villas located in both towers. The freestanding bathtub looks out on the bedroom through a large picture window. Above the living and dining room is a dramatic curved ceiling with recessed lighting. 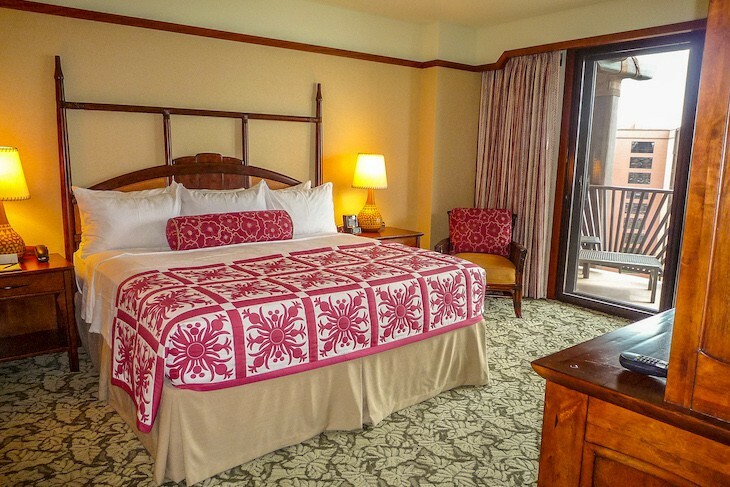 Guest rooms in the hotel section at Aulani offer 382 square feet adorned with earth tone colors and fabrics. 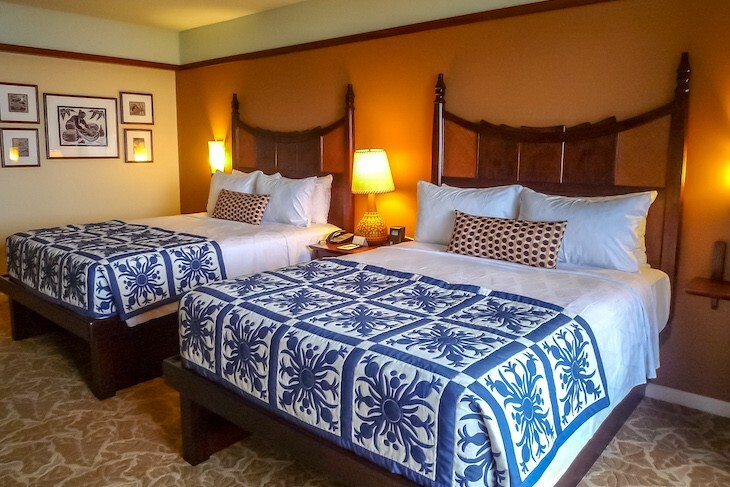 Beds, either two queens or a king, are covered in white duvets and festooned with pineapple patterned Hawaiian quilt bed runners in either royal blue or cherry red. Headboards are reminiscent of outrigger canoe posts and beams; the beds are conveniently high enough to slide your luggage underneath. King-bedded rooms also have a retro queen sleeper sofa in buttercup yellow embellished with a tangerine and royal blue print depicting birds of paradise and other flowers. A wall mirror is cleverly framed in what looks like carved interlocking fish hooks, and built into the bureau is a 37” flat-panel TV, an undercounter refrigerator, and a nice amount of drawer space. Even more storage can be found within the padded coffee table. 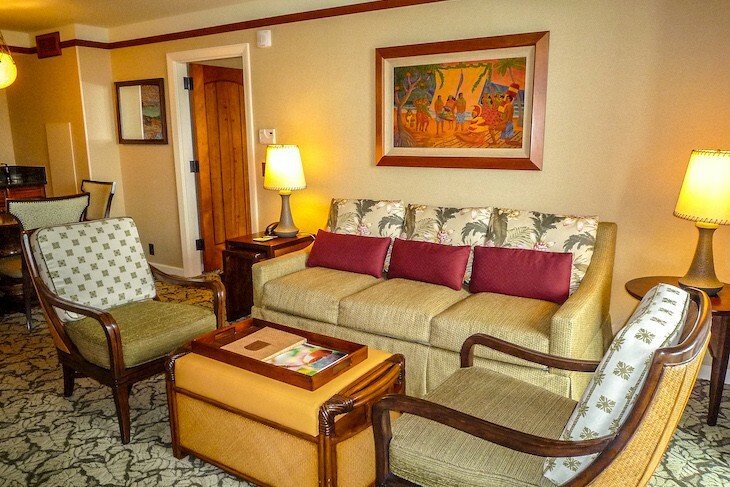 Upon a two-person table is a ‘ukulele-playing Surfer Mickey lamp, and Hawaiian themed artwork decorates the walls. The Hawaiian theme even extends to the carpet with taro leaf motif done in tones of cream and beige. 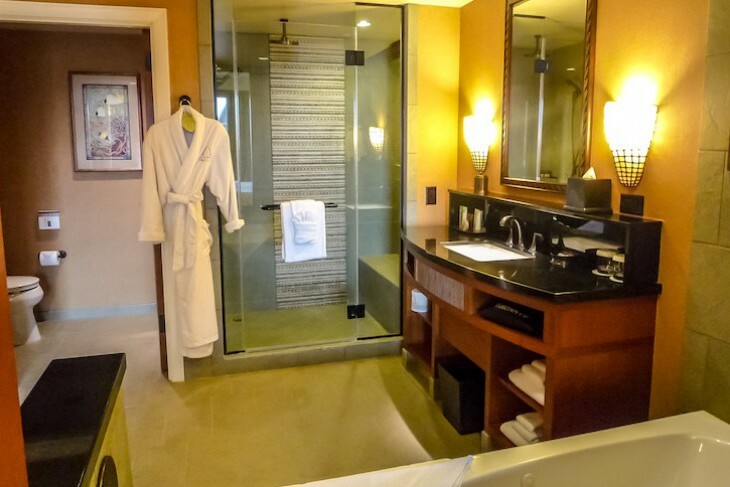 Standard are Blu-ray DVD players, laptop-size electronic safe, hairdryer, iron and ironing board, coffee maker, tea kettle, robes, ceiling fan, H2O Sea Salt products, pack ‘n’ play, and nightly turndown service. My only complaint is how dark the guest rooms are with lighting that is totally inadequate. 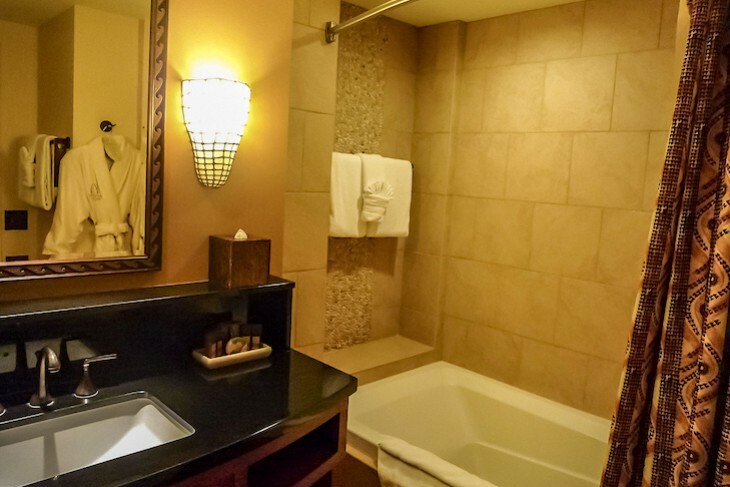 In the bath are a single sink set in a black granite countertop and a bathtub/shower. Cream-colored porcelain tile resembling stone and a ribbon of pebbled tile encircle the tub, and you’ll enjoy the luxury of both a hand-held and a rain showerhead. The commode is in a separate area behind louvered doors. All rooms offer either a patio or nice-sized balcony with two rattan outdoor chairs and a small cocktail table offering the following views: Standard View of the parking garage, conference center, or parking lot; Island Garden View of the spa’s hydrotherapy garden, mountains, or resort landscaping; Poolside Garden View with a partial view of the pool, courtyard, or water features; Partial Ocean View of the ocean and possibly the pool; or Ocean View with a full view of the ocean. All sleep four plus an infant. 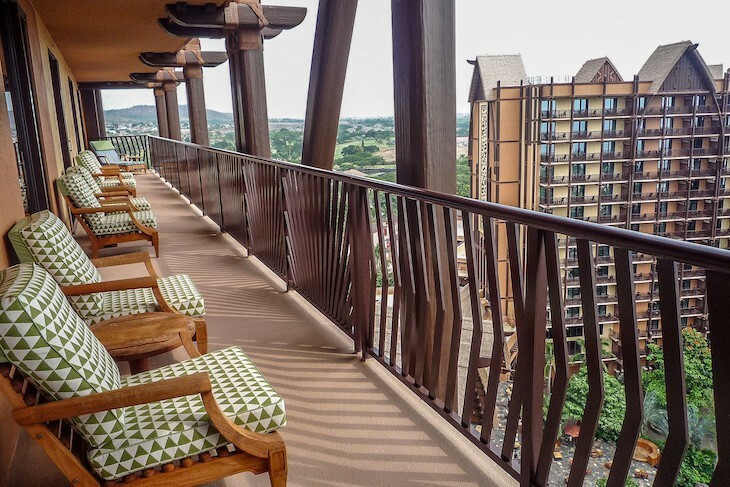 Decorated in virtually the same fabrics and décor as the hotel rooms, Aulani’s Disney Vacation Club villas offer a wide range of accommodation choices including studios, one-, two-, and three-bedroom options. Deluxe Studios are 356 square feet sleeping four plus an infant. In the entry hall is a black granite mini-kitchen with sink, microwave, and undercounter refrigerator, and off the entry is a single sink bath with a shower/tub combination featuring both a rain shower and standard showerheads as well as a separate commode area. A queen bed and queen sleeper sofa are accompanied by an entertainment center with flat-panel TV, coffee table with storage, and two-person table and chairs. 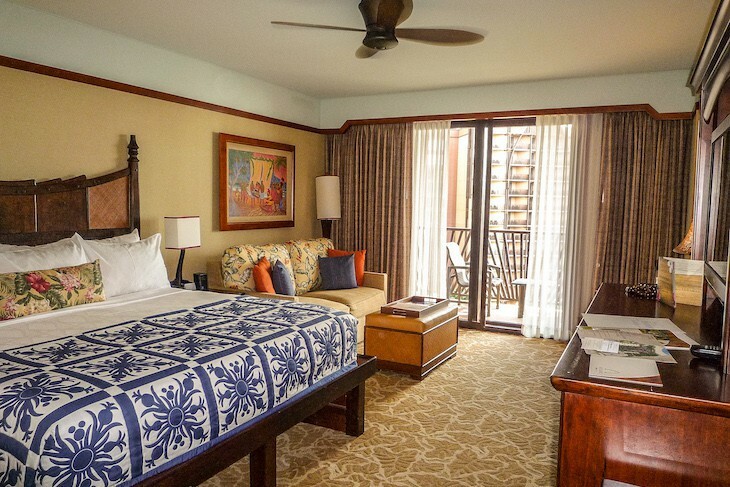 One-bedroom Villas come with 750 square feet and although they are just about the same size as Aulani’s Parlor Suite, you’ll find they are less expensive. Just past the entry hall is the villa's kitchen featuring wood floors, black granite countertops, sink, full-size refrigerator, dishwasher, microwave, and stove. A dining booth is just off the kitchen, and the adjoining living room offers a queen sleeper sofa as well as a murphy bed (it actually pulls out from the entertainment center) or a sleeper chair along with a coffee table, easy chair, and flat-panel TV. A half-bath and stacked washer/dryer are located next to the entry hallway. Off the living area is an angled balcony. 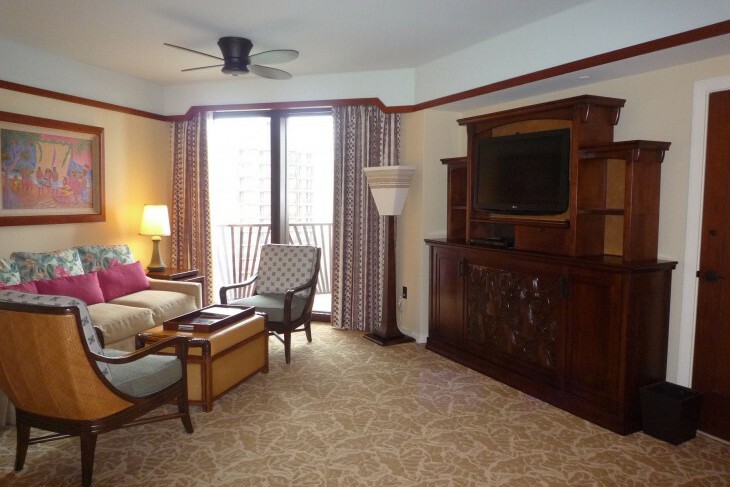 In the bedroom are a king bed, desk, entertainment center, and second balcony. 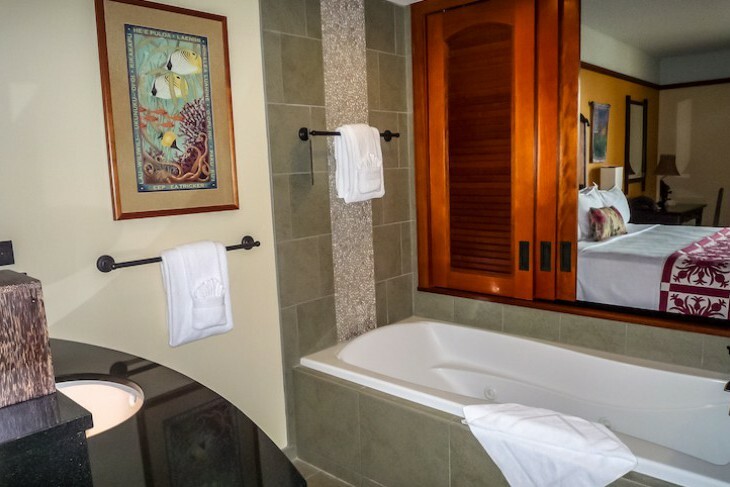 The bath has a shuttered window opening into the master bedroom and includes a large shower, whirlpool tub, and single sink with separate toilet area. Sleeps up to four guests plus an infant. The Two-bedroom Villa with 1,100 square feet is basically a studio combined with a one-bedroom villa. In it are two bedrooms, two and a half baths, kitchen, and living area. There's a king bed in the master, and either two queen beds or a queen bed and a sofa sleeper in the guest room. The guest room and living area share a balcony, and the master has its own. Dedicated Two-bedroom Villas have a half-bath off the entry, but the master bath does not offer a split-bath configuration, and the guest bedroom does not offer a mini-kitchen. Non-dedicated Two-bedroom Villas (in other words the second bedroom is considered a “lock-off” Deluxe Studio) have a door off the entry into the master bedroom bath’s commode/shower area, part of a two-part bath. Sleeps up to nine guests plus an infant. 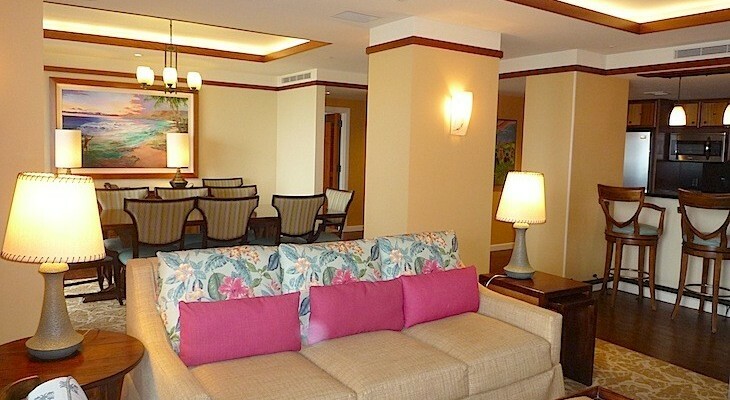 Grand Villas are three-bedroom beauties flanking each of the resort’s two towers, offering a full ocean view. These one-story villas have almost a suite feel to them. The living, dining, and kitchen are all together in a “great room” of sorts done in bamboo flooring and partially divided by columns. In the living area are a queen sleeper sofa and sleeper chair along with two easy chairs, coffee table, and entertainment center. The dining area has an eight-person table accessing a nice sized kitchen with black granite countertops and a three-person bar stool counter, side-by-side refrigerator with ice and water in the door, stove, dishwasher, microwave, and all the accouterments necessary for preparing meals. The master bedroom sits off the dining area; a hallway and separate entrance between the two has a closet with a stacked washer/dryer. 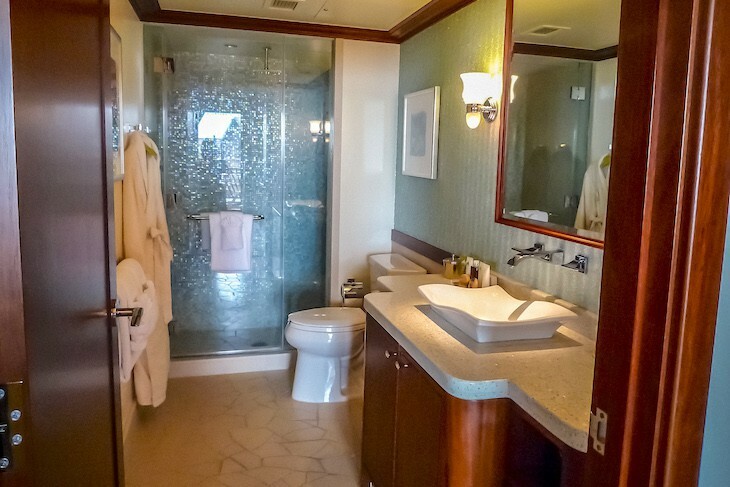 In the master is a king bed, entertainment center, and easy chair with an adjoining bath featuring a whirlpool tub, single sink, shower, and separate commode area with a Toto Washlet. Built into the vanity mirror is a “magic” TV. On the opposite side of the living area are two guest rooms, each with two queen beds. 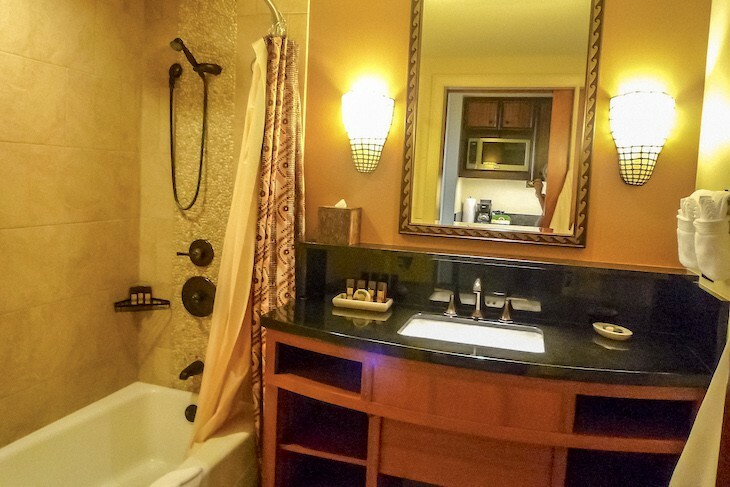 One has a bath in the hallway with double sinks; the other is a bath within the bedroom with a single sink. Sleeps up to twelve guests plus an infant. Parlor Suites (One-bedroom Suites). 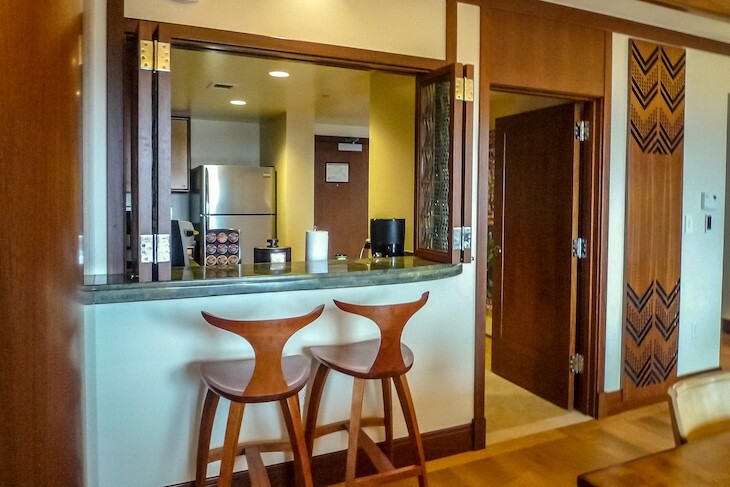 With 764 square feet these suites sleep up to five people and are a perfect choice for families. Very similar to a One-bedroom Villa minus the kitchen, each is named after a constellation. 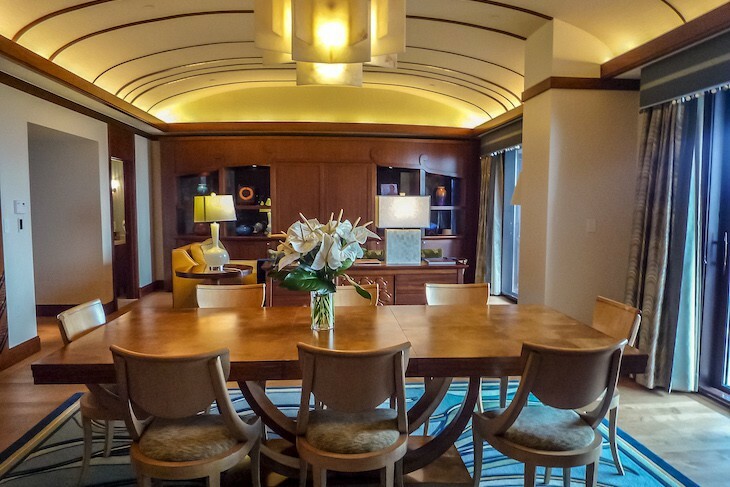 In the parlor area is a four-person dining table and wet bar, a queen sleeper sofa, two grasscloth occasional chairs, and a pull-down single bed that is stored in the entertainment center. Off the entry is a half-bath. Carpeting has a taro leaf motif just as in the guest rooms but in a moss green color. There’s a king bed in the master and an entertainment center with TV, desk, and occasional chair. 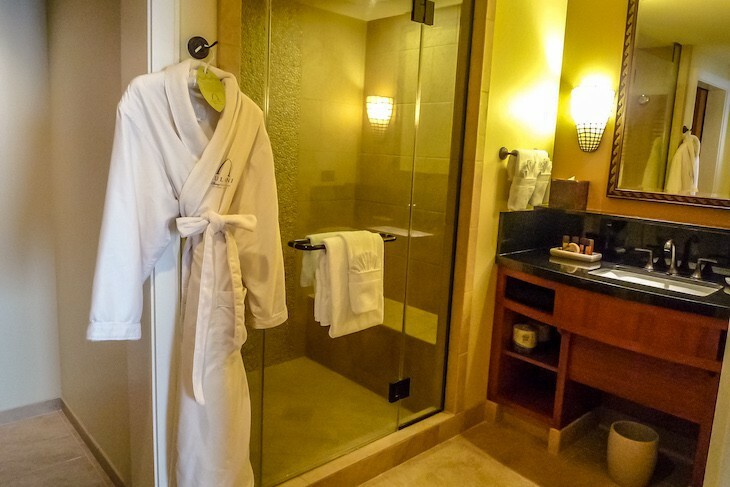 In the bath you’ll find a shuttered window opening into the bedroom, single sink, whirlpool tub, vanity, and shower in one area; and a commode and sink in the other. All is done in a green porcelain tile resembling stone with mosaic tile trim in the shower. 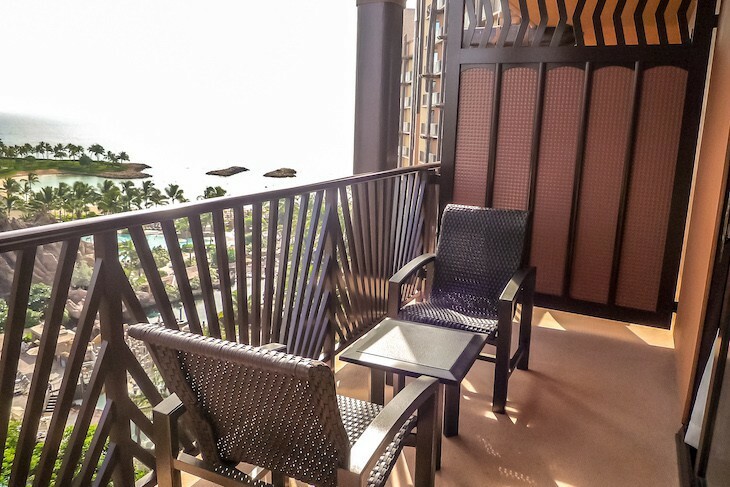 A balcony runs the length of the suite offering either ocean or partial ocean views. Sleeps up to five guests. 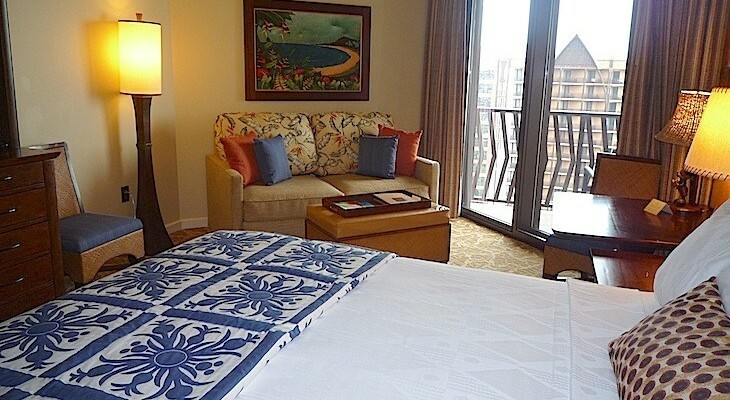 Lei Hulu Suite (Deluxe 1-bedroom Suite). 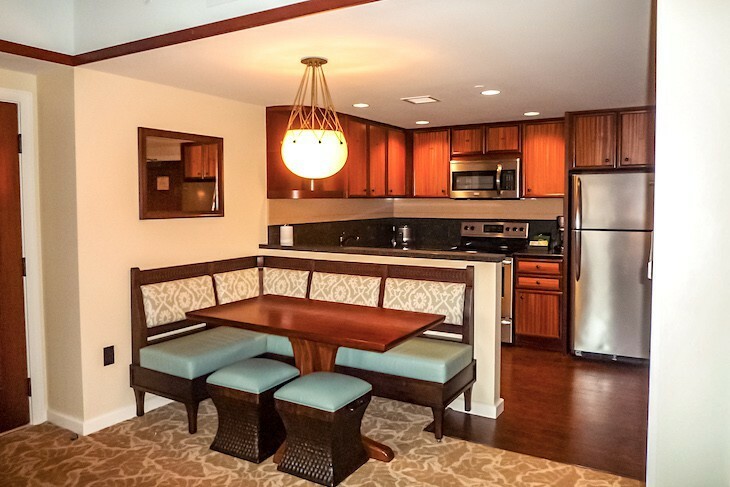 Located on the resort’s16th floor in the Waianae Tower the one-bedroom Lei Hulu Vice Presidential Suite offers an absolutely stunning Hawaiian-style contemporary look. With 1528 square feet sleeping up to five people, extra touches include integrated lighting controls, wood flooring throughout the entry, living, and dining areas, and a somewhat feminine ocean theme (the Hawaiians believe that the ocean possesses feminine qualities). The living area contains an oversized sleeper chair covered in buttercream and chocolate hued leather, leather topped coffee table, queen sleeper sofa in royal blue and moss green with a honu (turtle) motif, and occasional chair. One entire wall consists of a sumptuous wood entertainment center with a 42” flat panel TV and Blu-ray DVD player. The full bath adjoining the living area has a single, above-counter sink and a shower sparkling with blue glass tile. A credenza partially divides the living area from the dining room and its eight-person table. Above it all is a dramatic curved ceiling with recessed lighting. 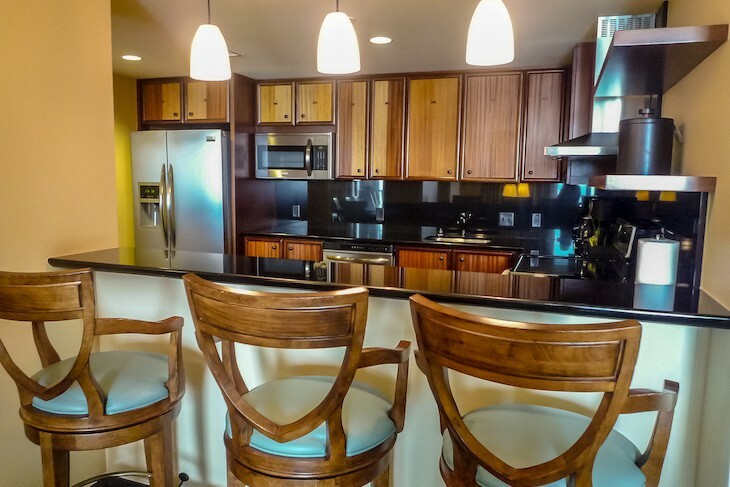 Near the dining area is a service kitchen that includes a full-size refrigerator, dishwasher, sink, and microwave. It features a pass-through bar with two bar stools and separate catering access. A balcony runs the length of the suite with pool and partial ocean views. In the beautiful bedroom sea foam green carpeting mimics the ocean waves. On one side of a dramatic contemporary pillar of wood is a wet bar and desk area; on the other side is a king-size bed adorned with a sea foam green spread accented in white and surrounded by white curtain sheers flowing from a modern four-poster frame. There is also an additional 42” flat-panel TV and Blu-ray DVD player, a chaise lounge, a sleek, contemporary chair with ottoman, as well as interesting glass and wood sculptures, and custom art. 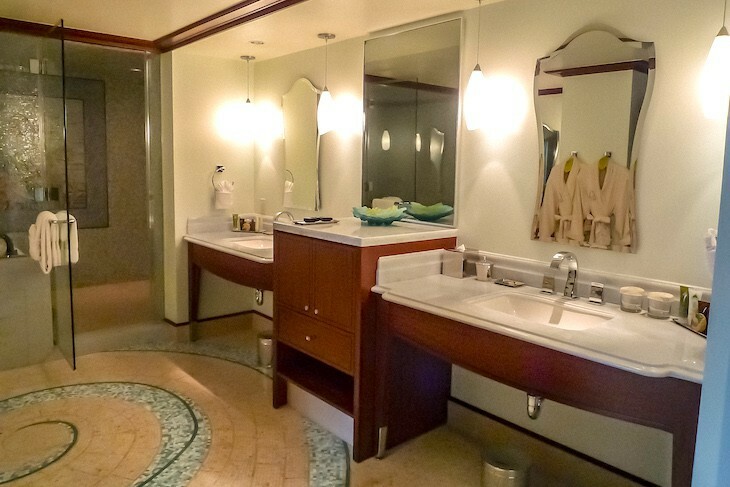 The aquatically themed Italian mosaic tile in the suite’s dramatic bath is exquisite and dominates the floor as well as the wet area's whirlpool tub and steam shower with its body jets and rain showerhead. The bath features dual sinks set within a white marble vanity, an additional bureau, vanity table, and separate commode area with a Toto Washlet. 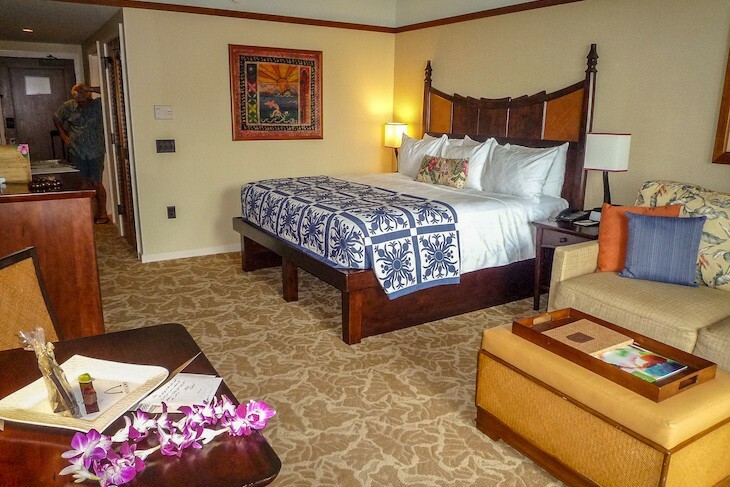 ‘Ahu ‘Ula Suite. 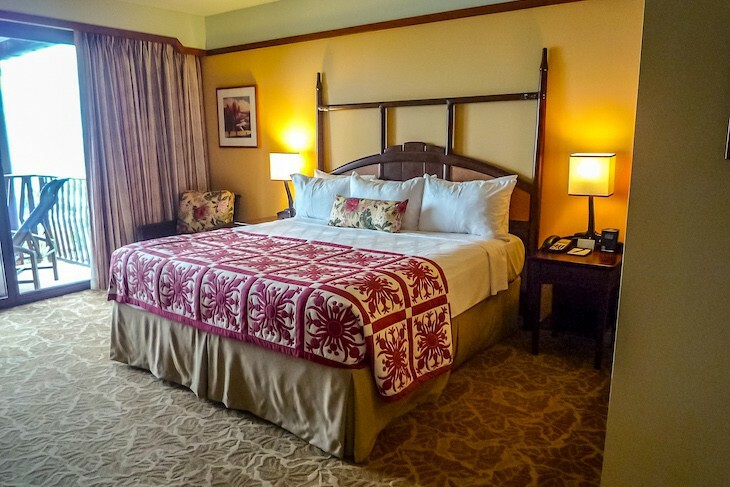 Also located on the resort’s16th floor in the Waianae Tower and next-door to the Lei Hulu Suite, the two-bedroom Presidential Suite has a masculine air, decorated in lush King Kamehameha red and gold tones. 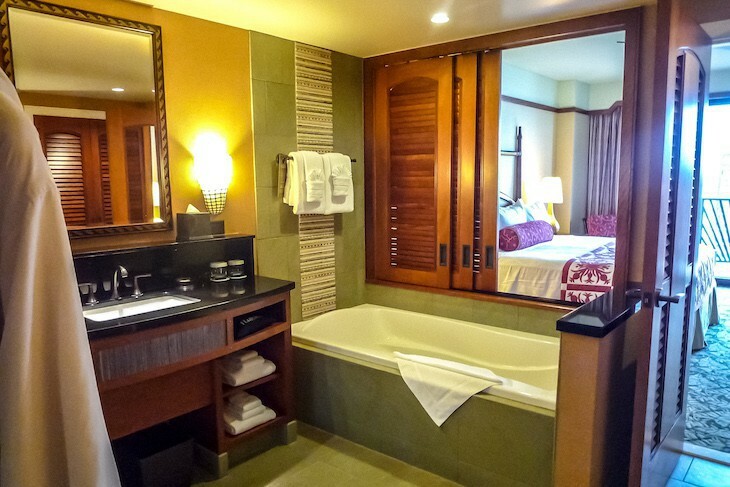 Definitely a darker atmosphere here, so if it’s light and airy you're looking for choose the Lei Hulu Suite instead. 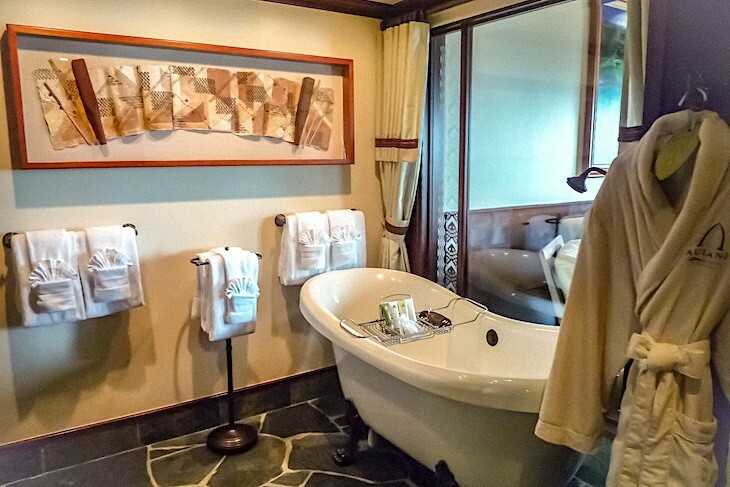 This gorgeous suite of 1,910 square feet has three full baths and sleeps up to six people. In the parlor area is a gold leather sofa, two easy chairs, a coffee table, and a large carved wood entertainment center with a 55” flat-panel TV and Blu-ray DVD player. 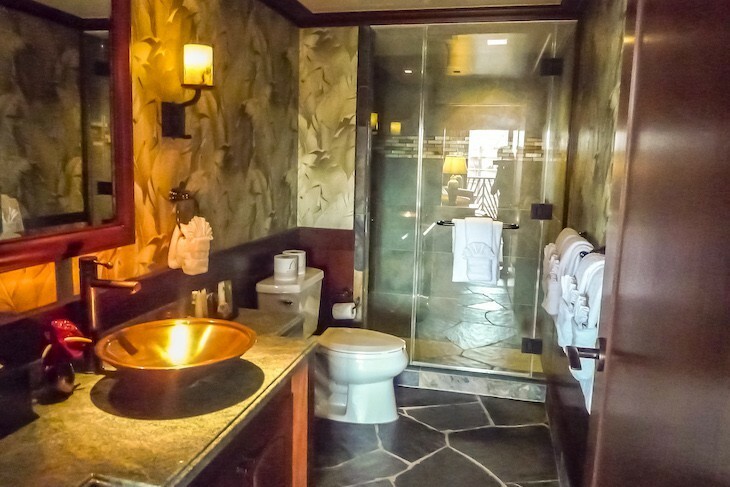 Just off the living area is an elegant bath with a brass above-counter basin, large shower, and flagstone flooring. The dining room seats six in gold leather chairs, and near the dining area is a service kitchen that includes a full-size refrigerator, dishwasher, sink, and microwave with a pass-through bar, two bar stools, and separate catering access. Wood flooring can be found throughout the entry, living, and dining areas, all of which is bathed in tastefully integrated lighting. A balcony runs the length of the suite with pool and partial ocean views. 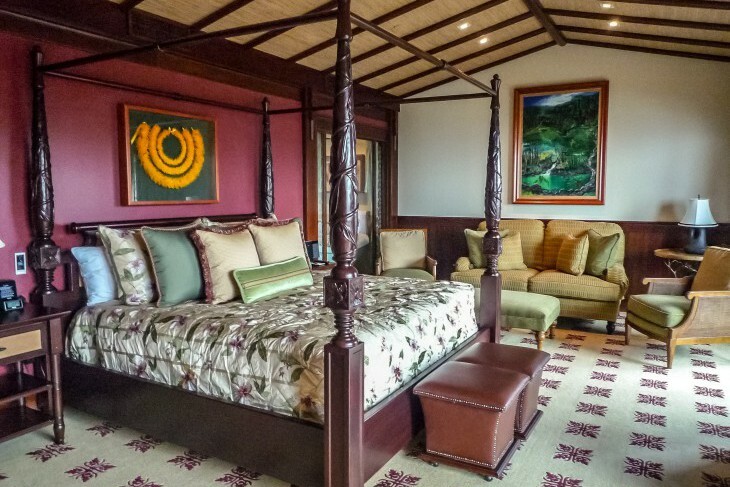 The large master bedroom boasts a king bed covered in a soft green, silken spread embroidered with flowers of silk thread, and the carpeting is a Hawaiian quilt motif in beige and red hues. 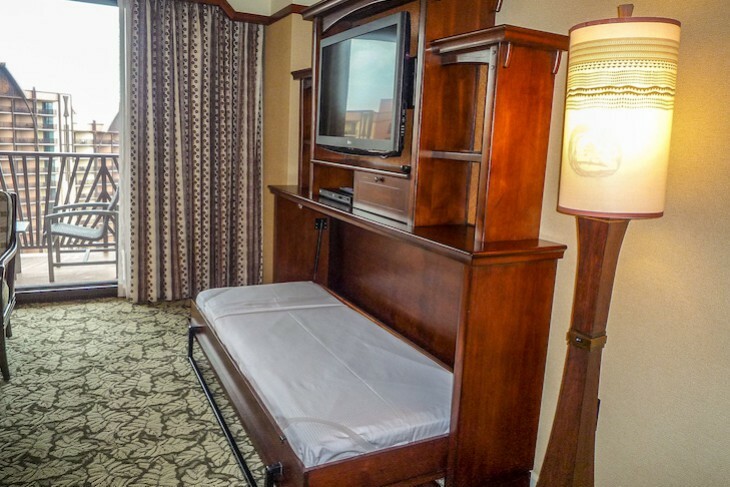 In the room’s entertainment center you’ll find an additional 42” flat-panel TV and Blu-ray DVD player. Atop the master bath’s lava flagstone and mosaic flooring are dual vanities of rich, dark marble, a large steam shower with rain head, and a freestanding bathtub that looks out on the bedroom through a large picture window. In a separate area is a Toto Washlet. The guest room has a queen bed adorned by the same kind of spread and carpeting as the master bedroom and provides a queen-size sleeper sofa and entertainment center with 37” flat-panel TV. 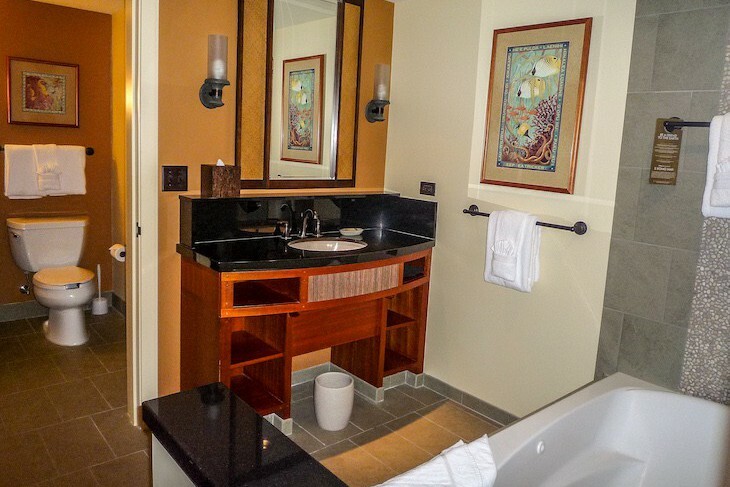 The bath is an Accessible one enhanced by roll-in shower, single sink, and commode all in one area. 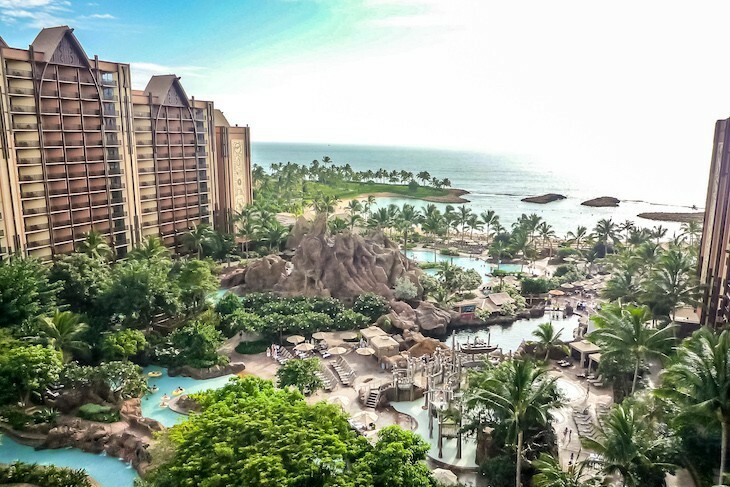 Let Us Help You in Planning Your Aulani Vacation! 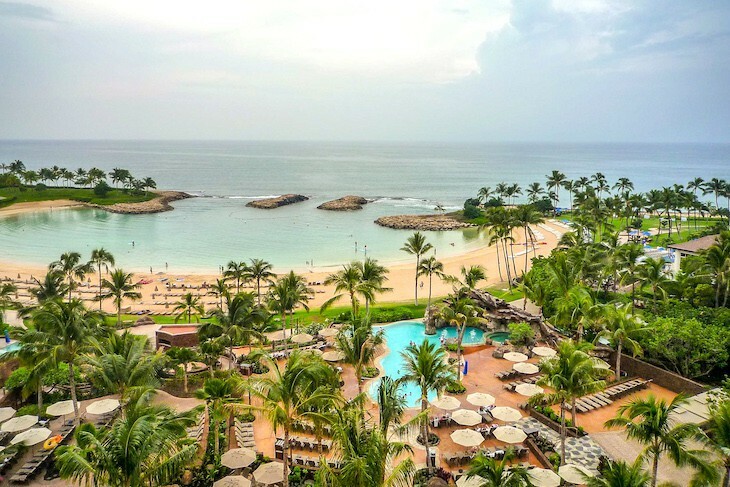 Allow me to connect you to the expert travel advisors at Glass Slipper Concierge to plan your Aulani vacation. Your luxury Travel Advisor expert will work with you to create the perfectly planned trip of a lifetime, making sure that nothing is left to chance. Please submit an online consultation request to begin.